The CRAFT Design Team is challenging you to create a card based on a book. For this challenge, the book I picked is called, “Grumpy Old Men by David Quantick”. The digi stamp I selected is by Bugaboo Stamps called, “GUS BIRTHDAY – OLD FART.” I love Bugaboo Stamps, but Ihave a soft spot in my heart for Gus and Stella. I coloured Gus with my Copic Marker, and added Glossy Accents to his glasses for that little extra. The stamp comes with the sentiment, but I wanted a slightly different arrangement so I computer generated it to fit with my card design. Please check out all the great stamps at Bugaboo and support our wonderful sponsors. We challenge you to make another Christmas card for youe 2017 stash! For this challenge I used another great image from Eureka Stamps - Dog Pile Digital Stamp ES-digi17703. I coloured the image with Spectrum Noir markers. I made two cards using the same image just to show that placement of the image can change to look of the card. I used papers from my stash. The sentiment is from SSS. Please check out and support our sponsor, DRS Designs who generously provided our weekly prize. One of my favorite card techniques is making a shaker card. I don’t make them as often as I should because they require lots of time and I have issues with getting them proper glued together. I purchased a fun village snowglobe thinlite die set by Tim Holtz called Snowglobe. When I started on this project the dies looked simple enough…NOT! There seemed liked a thousand little pieces, and vs cutting them out in various coloured card stock, I decided to cut them all out in white Neenah 80lb card stock and either ink or use my Spectrum Noir markers. This “simple” card took me over three hours to make! But it did turn out very nice. I am sure if I was to do it again, I could shave at least an hour off my time. The sentiment is from MFT, and the Stitched Snowflakes are from SSS. The sequins are from Taylored Expressions. Please join us and show off your creativity! 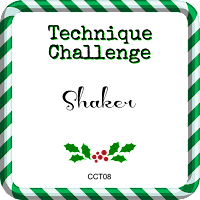 This challenge will last for the whole month of April 2017 – anything goes as long as it’s Christmas – it doesn’t have to be a card, you can link any project as long as it’s Christmas! For my card I used the Sizzix Bigz XL Stocking Gift Holder Steel die. I cut the stocking in non-Christmas patterned papers to gave it that elegant feel. I added bling from my stash, and a sentiment from Papertrey Ink. I mounted the stocking on a Christmas themed card. The card dimension is 5 x 7. I made two different cards using different papers. For this week’s challenge you are to make a card using White and one other colour. I used Black, White, and a light shade of Blue for one card, and Black, White and Red for the other. This week’s sponsor is Eureka Stamps, and they have a diverse line of unmounted and cling mounted images, encompassing over 30 theme areas… from “accents” to “winter” and over 1500 images in between along with over 1000 of these images available in digital (digi) format. I made 4 cards using 2 of their fabulous stamps, Crying Lamb ES-digi13802 and Party Poopers ES-digi14303. For the touch of colour on the images I used my Spectrum Noir Markers. Please sponsor our sponsors, who generously provide our wonderful prizes.